Interesting ad on the New Haven CList for an IRO fixie. 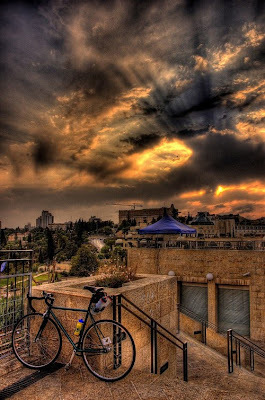 Seems the only picture the owner has is an extremely artistic shot of his bike from Jerusalem which seems to invoke imagery from the bible if there was an illustrated version. I have an IRO fixed gear bike for sale. It is about 2 years old. 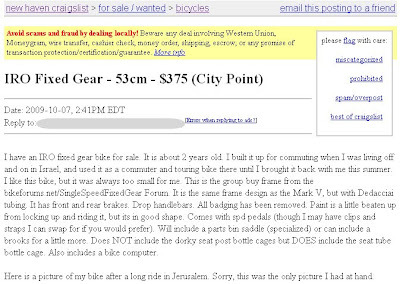 I built it up for commuting when I was living off and on in Israel, and used it as a commuter and touring bike there until I brought it back with me this summer. I like this bike, but it was always too small for me. This is the group buy frame from the bikeforums.net/SingleSpeedFixedGear Forum. It is the same frame design as the Mark V, but with Dedacciai tubing. It has front and rear brakes. Drop handlebars. All badging has been removed. Paint is a little beaten up from locking up and riding it, but its in good shape. Comes with spd pedals (though I may have clips and straps I can swap for if you would prefer). Will include a parts bin saddle (specialized) or can include a brooks for a little more. Does NOT include the dorky seat post bottle cages but DOES include the seat tube bottle cage. Also includes a bike computer. Here is a picture of my bike after a long ride in Jerusalem. Sorry, this was the only picture I had at hand.